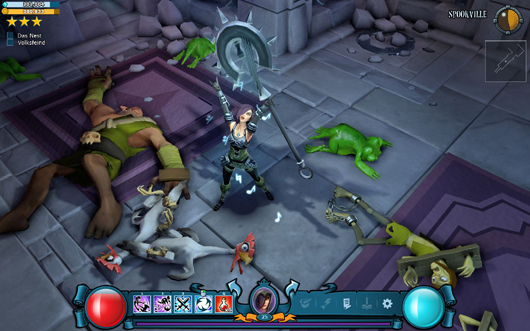 Ubisoft’s free-to-play dungeon crawler The Mighty Quest for Epic Loot has gone into open beta. Anybody can sign up and start playing through Steam, the game’s official website or Uplay. In The Mighty Quest for Epic Loot, players choose a hero from four different classes and raid other players’ castles in search of treasure and glory. To build a castle, you select trap placement and enemy spawn locations, then publish your personalized gauntlet online through the game’s built-in social network. Each castle run culminates in some sort of boss encounter and, if the baddy is bested, a treasure room full of riches. After being criticized for The Mighty Quest for Epic Loot‘s microtransaction elements in last year’s closed beta, developer Ubisoft Montreal stripped all pay-to-win elements from the game. The Mighty Quest for Epic Loot is currently only available on Windows PC.